METHODS: This study is triple blind before and after clinical trial was performed on three groups of thirty (n = 90) of the elderly with mean age 63.41 ± 6.88 who were members of the elderly centers of Tehran city neighborhoods with average to unfavorable lifestyle score. The first test group was subjected to group motivational interviewing during five sessions. The second test group was subjected to distant multimedia training. No training was given to the third group as the control group. After 3 months, the lifestyle questionnaire was completed in three groups. The results were analyzed by these techniques as statistical tests such as mean, standard deviation, relative frequency, and absolute frequency were used. The inferential statistical tests such as paired t-test and one-way ANOVA were used, respectively, to compare the pre- and post-mean scores and in each group and compare the mean scores of lifestyle dimensions in three groups. RESULTS: Both motivational interviewing and multimedia education have been effective in changing the lifestyle of the elderly, but according to the findings, motivational interviewing has a greater impact on elderly lifestyle. The total lifestyle score in four areas such as nutrition, self-care, mental health, and physical activity was significantly different in the three groups after the intervention (P < 0.001). CONCLUSIONS: Each educational program can somehow improve behavioral skills in individuals. Effective teaching methods should address the learning difficulties and inability to learn during the aging period. The results of this study can be a step toward the elaboration of strategies for education and promotion of healthy lifestyle in the elderly. This clinical trial study was performed in three groups with IRCT201505068290N7 code in the Iranian Clinical Trials Center. The sample population included elderly people studied were younger elderly people aged 55 years and older, who were on the verge of entering the elderly and had autonomy of functioning, lack of specific diseases and limitation of movement, and had literacy in reading and writing, and living in their families. They were doing their own work and were the members of the daily centers of neighborhood aging cultural and recreational centers are located in the 22 districts of Tehran municipality. These centers have various focal points, including the Health Center, the Women's Center, the Elderly Club, and whose purpose is to provide various services in the cultural, educational, artistic, and sports fields of each neighborhood (374 neighborhood houses in 22 municipalities). Thus, in each region, there are several neighborhoods that people of each neighborhood due to the geographic extent of the area in question cannot interact and have a specific relationship with the exchange of information. Accordingly, in a cross-sectional descriptive study, the lifestyle of 400 members of these centers was evaluated by the researcher. The criteria for entry to study were at least 55 years old, membership in the health centers' senior aging centers, lack of specific diseases and limiting mobility, as well as the consent of individuals to participate in the study. Data were collected using a questionnaire on healthy lifestyle measurements in Iranian elderly. The questionnaire was designed by Ishaqi et al. (2009) with a demographic section and the main part containing 46 question. For sampling at this stage using the Altman's nomogram and the standard difference calculated from previous studies (the standard difference was 1.42), including α = 0.05, α = 10%, β and power = 90% required sample in each group. At least 28 people were calculated and considering the drop of about 10%, the sample size for each group was estimated to be about thirty. Therefore, based on the findings of the first descriptive study (lifestyle scores), those with poor or moderate scores, 90 were randomly selected and finally, they were randomly assigned to two intervention groups (motivational interviewing and multimedia education) and control were divided. The first test group was subjected to a group motivational interview (a 2-h session on per week) during the five sessions. The structure of the sessions was extracted from the group motivational interviewing workbook and prepared and conducted by the researcher after coordination with the faculty members. The first session was focused on familiarizing and preparing the elderly. At the second session, the elderly expressed their feelings about lifestyle changes. The third session discussed the positive and negative aspects of lifestyle changes and values were discussed in the fourth session. Values are internal elements that originate from one's own character that help determine goals and activities. Decisions that are consistent with individual values provide a sense of satisfaction and enhance the energy and self-esteem of the individual. Fifth session deals with the identification of tempting positions and the final evaluation. The purpose of this session is to reassess the commitment, level of trust and confidence, and motivation for change. Identifying situations and helping to assess and at the same time increase self-confidence are other goals of this session. At this stage, the second test group was simultaneously subjected to multimedia-based distant instruction, in which the training content was provided as educational software. The content of educational multimedia content was provided to the test group as training software. Based on the use of the comments of more than ninety elderly experts on the Delphi scheme, they conducted three rounds by E-mail and the educational content for each selected title including text, photos, videos, and audio was collected and approved by the relevant professors. The software designer was also asked to use specific features such as the use of video and animation and photo and video in order to better use this age group. In cases where the educational text was available, the audio text was also placed next to it. So that only by clicking on specific subjects, people could use educational facilities, and in several sessions, the researcher displayed the software produced publicly and used it for use by the elderly or family members with whom they lived. The educational multimedia software was given to the intervention group and Tutorial on how to use the software. Moreover, advice was given on how to use the software by phone and face-to-face. It should be noted that in this study, elderly people who were able to use computers or in the family could benefit from the help of family members, such as their children or grandchildren, were used. No training was provided for the third group as the control group. The third phase of the study after a 3-month period, the lifestyle questionnaire was given to the first and second groups and the control group for measuring the effectiveness of the trainings and their impact on the elderly lifestyle. The lifestyle of the three groups was evaluated and the content of the training was provided to the control group in the form of software at the end and after the third stage test. Descriptive statistics (mean, standard deviation, relative frequency, and absolute frequency) were used. The inferential statistical tests such as (paired t-test) and one-way ANOVA were used, respectively, to compare the pre- and post-mean scores and in each group and compare the mean scores of lifestyle dimensions in three groups. The mean age of the intervention group was 63.41 ± 6.88, with the minimum and maximum ages of 55 and 85 years, respectively. A total of 14 individuals were not covered by insurance and 82 individuals were not dependent on others in terms of carrying out their personal tasks [Table 1]. Lifestyle score in total and in four areas (nutrition, self-care, mental health, and physical activity) was significantly different in the three groups after the intervention (P < 0.001). Tukey's test showed that this difference was related to the difference between the control and the other two groups [Table 2]. 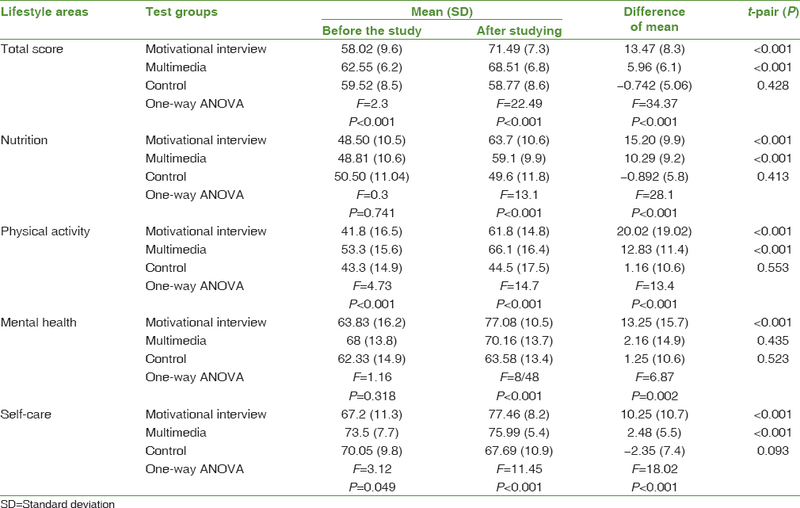 Furthermore, there were significant differences between the mean changes of pre- and post-intervention scores in the multimedia and motivational interviewing groups in the follow-up tests. The difference in mean scores indicates that interventions of motivational interviewing have a greater impact on multimedia both in the total score and in other areas interventions [Table 2]. In this study, the findings indicate that postintervention lifestyle score is significantly different in three groups (motivational interviewing, multimedia, and control groups). In line with this finding on the impact of motivational interviewing, one can refer to Cunning et al. 's study who concluded that motivational interviewing could produce useful results in dealing with a wide range of health issues faced by the elderly such as weight loss, quit smoking, diet improvement, physical activity, cholesterol lowering, pressure, and blood sugar control. Movahedi also described the role of motivational interviewing in self-care education to the elderly in an overview study. In line with this study, we can refer to Murphy's studies, which are based on the effectiveness of motivational interviewing to reduce the use of alcohol and marijuana. Audrain who described the effectiveness of the motivational interviewing in changing smoking behavior. Taylor's study which described motivational interviewing as effective in changing lifestyle for weight loss. We can also refer to Navidian's study which indicates the effect of motivational interviewing on increasing lifestyle self-efficacy and the effectiveness of this method in reducing the symptoms of obsessive-compulsive patients. In general, the findings of the studies all indicate the desirable effect of the motivational interviewing on the behavioral changes, to which people are accustomed years and the continuation of these behaviors may cause disease or disability. 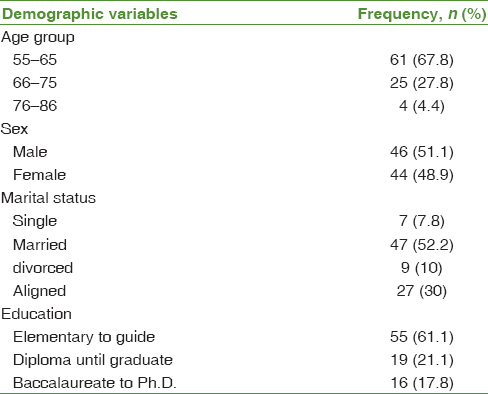 In addition, the findings in this study indicated an increase in the total score of lifestyle level and an increase in score in other lifestyle areas after applying multimedia education software in the elderly [Table 1], which is in line with the Molinari's study, because he concluded in his study that the elderly viewed training provided through computer programs as useful and showed significant improvements in their ability to perform their personal duties. Gerven et al. also concluded that multimedia education has a more efficient performance than traditional education and based on the findings of this study, multimedia-based education is more useful for the elderly than the youth age group. While comparing the effectiveness of both traditional and electronic teaching methods used for healthy lifestyle in the field of nutrition education for the elderly, Abedi also concluded that educational videos are more effective in increased nutritional awareness of the elderly. Furthermore, the elderly were more satisfied with educational videos compared with the traditional method as the method used for teaching healthy lifestyle. On the other hand, the cost of multimedia-based education to the elderly is lower compared to book-based education. Therefore, multimedia-based education has proven to be a more efficient and effective method to promote the health status of the elderly. Daneshmandi et al. also concluded that in case of availability of favorable conditions in terms of time and place and teaching aids, training with multimedia software packages is more effective than the lecture method in increasing the level of knowledge of individuals. According to the above studies, it can be stated that in terms of the effectiveness of multimedia education software on learning and changing the behavior of the elderly results are consistent with the current study, but it is not more efficient than motivational interviewing method because, along with the benefits of using multimedia software in educational programs, there are also disadvantages including conditions of use of multimedia software such as access to appropriate computers and having at least computer literacy are essential to use the capabilities of this educational media. In addition, users' fears due to the need for technical knowledge to use educational content and the emergence of negative results due to the excessive amount of time and carelessness in the supply of educational software are among obstacles to the use of multimedia educational software. The results show that the mean difference between pre- and post-intervention mean score of lifestyle in the motivational interviewing group 13.47 (8.3) was more than the multimedia intervention group 5.96 (6.1%). This difference can be seen in all aspects of lifestyle. One can consider the principles of the motivational interviewing to justify the attractiveness of motivational interviewing in the elderly and their more willingness toward it, compared with the multimedia method, so that the principles and spirit of motivational interviewing emphasize on participation, calling, and respect for the autonomy of individuals. In addition to the principles, motivational interviewing consists of the following principles: empathy and seeing the world from the eyes of the authorities without judgment and criticism, increasing the contradiction between current behaviors and values that motivate a person in life, avoid controversy for change and supporting individual's self-efficacy, believing that the authorities can do the necessary measures and succeed in the making the change. Therefore, according to the spirits of the elderly, each of whom has positive experiences in life and less involved in social interactions, the principles of motivational interviewing are more consistent with the spirits of the elderly. Furthermore, the elderly tend to have a great deal of interest in their peer group. Therefore, according to motivational interviewing techniques, which include asking open questions, reflexive listening (reflective thinking), authorities confirmation, summarizing the discussions performed, and the call for talk about change, the formation of aging groups led by an expert makes it possible for individuals in these groups to participate actively in decision-making to prevent, diagnose, and treat the common diseases of this age by sharing their experiences. In addition, the quality and lifestyle of the elderly are improved by expressing self-care issues in these groups. In this regard, the result of Moradi's study, which indicate the significance of the relationship between social participation and its dimensions with the quality of life of the elderly and Livasar's study showed cognitive group counseling is more effective in reducing anxiety and depression than drug therapy. In general, the results indicated the effectiveness of both methods on changing the lifestyle of the elderly. There was a significant difference between lifestyle score in motivational interviewing and multimedia education groups before and after the intervention so that the motivational interviewing group had a higher mean score in all dimensions as well as overall lifestyle score, and this mean difference was significantly higher than the multimedia software education group. However, there was no study to compare the results in the field of comparing motivational interviewing and multimedia education, which necessitates more extensive studies in this field. To carry out this study, there were a number of difficulties and limitations that could be mentioned: the lack of proper cooperation between some municipal officials and authorities to enter the study environment. Access to the elderly in some neighbourhoods and lack of proper cooperation to fill out questionnaires. The timing of completing the questionnaires due to the dispersion of villages in different neighbourhoods of Tehran Fatigue and malaise of the elderly due to age constraints and also the number of elderly people familiar with computers was limited. The presence of visual and auditory problems in order to complete the questionnaire, which was solved with the help of guidance from the researcher and problem-solvers. In general, it can be concluded that any educational program can somehow improve behavioral skills in individuals. Effective teaching methods should be considered the learning difficulties and inability to learn during the aging period. Knowledge was the most important factors influencing elderly healthy lifestyle. It seems that increasing the elderly awareness about the links between lifestyles and chronic diseases might help them to understand the potential health consequences of their actions and encourage them to make much-needed lifestyle changes. Each educational program can somehow improve behavioral skills in individuals. Effective teaching methods should address the learning difficulties and inability to learn during the aging period. The results of this study can be a step toward elaboration of strategies for education and promotion of healthy lifestyle in the elderly. This article is a part of the thesis of nursing education at the Faculty of Nursing and Behavioral Sciences Research Center of Baqiyatallah University of Medical Sciences, which was confirmed by the 4095 Code of Ethics at Baqiyatallah University of Medical Sciences. The authors would like to express their gratitude and appreciation to all the elderly participating in the study as well as to the relevant managers and authorities for their cooperation. Joghatayi MT, Nejati V. Health status of elderly people in Kashan city. Salmand Iran J Ageing 2006;1:3-10. Maghsoudnia SH. Primary Health Care for Elderly in Iran. 1st ed. Tehran: University of Social Welfare and Rehabilitation Sciences; 2006. Paknejad B, Jandaghi J, Rahmani KH. An Outline of Geriatrics Medicine. 4th ed. Tehran: Nafis Press; 2004. Zanganeh M, Haji Ebrahimi M. Malvandy A. Statistical Yearbook of Golestan Province Health Center 86 Years. Health Center of Golestan Province. 1st ed. Gorgan: Reyhani Publisher; 2008. p. 40-56. Khoshbin S, Ghousi A, Frahani A, Motalagh ME. Guideline of Promote Healthy Lifestyles in the Elderly, Nutrition and Physical Activity. Tehran: Office of Elderly Health, Office of Family Health and Population; 2007. Aihara Y, Minai J, Aoyama A, Shimanouchi S. Depressive symptoms and past lifestyle among Japanese elderly people. Community Ment Health J 2011;47:186-93. Tanaka H, Sasazawa Y, Suzuki S, Nakazawa M, Koyama H. Health status and lifestyle factors as predictors of depression in middle-aged and elderly Japanese adults: A seven-year follow-up of the Komo-Ise cohort study. BMC Psychiatry 2011;11:20. Banegas JR, Guallar-Castillón P, Rodríguez-Artalejo F, Graciani A, López-García E, Ruilope LM, et al. Association between awareness, treatment, and control of hypertension, and quality of life among older adults in Spain. Am J Hypertens 2006;19:686-93. Spencer CA, Jamrozik K, Lawrence-Brown M, Norman PE. Lifestyle still predicts mortality in older men with established vascular disease. Prev Med 2005;41:583-8. Ashrafizadeh S, Suri H. Effective study habits and lifestyle of hypertension in the elderly in Ahwaz. Kerman Univ Med Sci 2006;13:29. Womble J. E-Learning: The Relationship among Learner Atisfaction, Self-Efficacy and Usefulness. United States: San Dieg Alliant International University; 2007. Campbell RJ, Nolfi DA. Teaching elderly adults to use the internet to access health care information: Before-after study. J Med Internet Res 2005;7:e19. Gore L. Study Finds Computerized Health Intervention in Emergency Departments. Effective in Annals News Releases. Available from: http://www.acep.org/1,2590,0.html. [Last retrieved on 2003 Jan 17]. Abedi GH, Naghibi A, Alizadeh Khoei M, Faghrzadeh H, Sharifi F, Rezaei Rad M, et al. Efficacy of the two educational methods: Traditional and electronic techniques in training of nutritional aspect to healthy life style in elderly. Iran J Diabetes Metab 2013;13:9-20. Sharifi-Rad GH, Motalabi M, Mohebi S. Assess the Needs Among of Health Care Systems. Tehran: Sokhangostar; 2007. Cummings SM, Cooper RL, Cassie KM. Motivational interviewing to affect behavioral change in older adults. Res Soc Work Pract 2008;19:195-204. Van Gerven PW, Paas F, Van Merriënboer JJ, Hendriks M, Schmidt HG. The efficiency of multimedia learning into old age. Br J Educ Psychol 2003;73:489-505. Fields A. Resolving Patient Ambivalence: A Five Motivational Interviewing Intervention. Portland: Hollifield Associates; Electronic & Database Publishing, Incorporated; 2006. Navidian A, Poorsharifi H. Motivational Interviewing: A Practical Guide Motivational Interviewing Group. Mashhad: Sokhangostar; 2011. Navidian A, Abedi M, Baghban I, Fatehizade M, Poursharifi H. Effect of motivational interviewing on the weight self-efficacy lifestyle in men suffering from overweight and obesity. J Behav Sci 2010;4:149-54. Movahedi M, Khamseh F, Ebadi A, Haji Amin Z, Navidian A. Assessment of the lifestyle of the elderly in Tehran. J Health Promot Manage 2016;3:51-9. Eshaghi S, Farajzadegan Z, Babak A. Design and Lifestyle Questionnaire in Elderly. Quarterly Journal of Isfahan University of Medical Sciences. Winter the Ninth Year; 2009. p. 91-9. Murphy DA, Chen X, Naar-King S, Parsons JT, Adolescent Trials Network. Alcohol and marijuana use outcomes in the healthy choices motivational interviewing intervention for HIV-positive youth. AIDS Patient Care STDS 2012;26:95-100. Audrain-McGovern J, Stevens S, Murray PJ, Kinsman S, Zuckoff A, Pletcher J, et al. The efficacy of motivational interviewing versus brief advice for adolescent smoking behavior change. Pediatrics 2011;128:e101-11. Taylor RW, Brown D, Dawson AM, Haszard J, Cox A, Rose EA, et al. Motivational interviewing for screening and feedback and encouraging lifestyle changes to reduce relative weight in 4-8 year old children: Design of the MInT study. BMC Public Health 2010;10:271. Navidian A, Haghshenas L, Abedi MR, Baghban I, Fatehizadeh M. Comparing the effectiveness of group cognttive behavior therapy and its integration with motivational interviewing on symptoms of patients with obsessive-compulsive disorder. J Res Behav Sci 2011:9:13-23. Daneshmandi M, Asgari A, Tadrisi SD, Ebadi A, Mokhtari Nori J. Study of the effect of self-aid and buddy-aid education using lecture and multimedia software package on the performance level of military personnel. Iran J Crit Care Nurs 2011;4:121-6. Molinari DL, Blad P, Martinez M. Seniors' learning preferences, healthy self-care practices and computerized education implications. Online J Rural Nurs Health Care 2012;5:48-58. Moradi S, Fekrazad H, Mousavi M, Arshi M. The study of relationship between social participation and quality of life of old people who are member of senior association of Tehran city in 2011. Iran J Ageing 2013;7:41-6. Levasseur M, Desrosiers J, Noreau L. Is social participation associated with quality of life of older adults with physical disabilities? Disabil Rehabil 2004;26:1206-13.